To me there is one clear cut, above all else, benefit from living in the great state of North Carolina or AL, AL, CT, DE, GA, HI, IN, KY, MD, ME, MI, MO, MT, NJ, NY, OH, PA, SO, TX, VA, or WV. This, above all else benefit, is none other than beer company food REBATES. No I am not drunk. I am talking about these little rebates offered at various times of the year from beer companies for a variety of food including steak, seafood, turkey, stuffing, gravy, cranberries, potatoes, deli items, pies and many other things. The absolute best part is that these rebates include a clause for certain states that "NO BEER PURCHASE IS REQUIRED". North Carolina happens to be one of these great states. If you don't know about this, then you don't know what you are missing. This summer I enjoyed several pounds of ribeye and filet mignon all thanks to Miller Lite and Heineken summer meat rebates. All I had to pay for was the sales tax and 3 postage stamps for the rebates. I ended up with $48.35 worth of delicious steaks for $2.08. Wait you say - this sounds too good to be true. Whats the catch? Believe it or not I haven't found one yet and I have successfully received at least 4 of these rebates. These rebates typically are not for any particular brand food merely categories such as seafood, meat, or turkey. 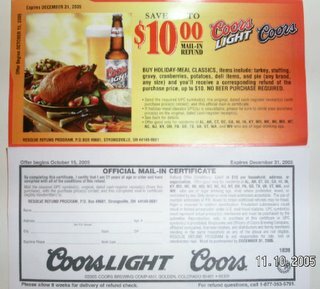 Last night I was strolling through my local grocery store, and once again, found a promotion for Coors to receive a $10 rebate for holiday-meal classics including turkey, stuffing, gravy, cranberries, potatoes, deli items, and pies with no beer purchase required. I plan to take full advantage of this the next time I go shopping. Of course as with any rebate, I highly recommend making copies of any material submitted for rebates in case you don't receive your rebate. Now off to your local grocery store and see if you too can take advantage of these wonderful gifts from the great beer gods - err, I mean companies. Thanks, I didn't know about these...we're in Texas so I'll be on the lookout for these rebate coupons the next time we're at the grocery store. That looks great - too bad I can't take advantage of it in Massachusetts. Good find! Where do you find these rebates? Are they near the beer? Just curious. I live in Indiana, and would love to get some money back from my grocery spending. Dang. No beer rebates here. Anyone know someplace in Bethesda that has them? My local beershop does not.